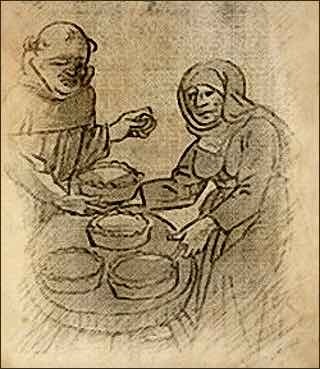 Renaissance pie recipes often called for wine, nuts, fruits, herbs, spices, and minced meats. 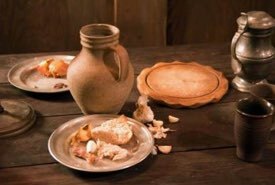 Seventeenth century pies were usually smaller and chewier than today's pies, spiced, and highly sweetened with sugar or honey. 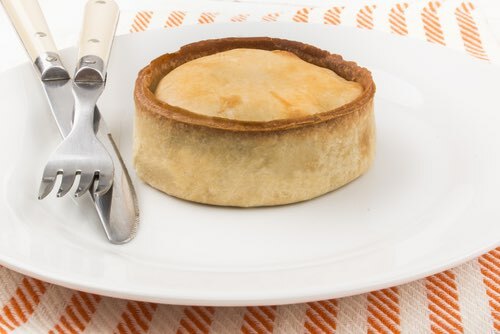 They were very similar to today's scotch pies in appearance. The edges of the pies were often crimped for decoration and on festive occasions, their top crusts were decorated with comfits and molded sugar paste, and they had flavored sugars strewn over them. Violet and rose flavored sugars were favored. Occasionally, the top crusts were extravagantly gilded with an edible gold leaf when served to nobility at royal banquets. You'll have fun experimenting with these historical dessert recipes. 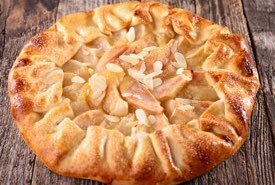 Ingredient quantities aren't given, but history records that pies were often preferred very sweet, so be generous when adding sugar. Some of the ingredient combinations called for in the historic Renaissance pie recipes might seem a bit odd to our modern palettes, but these early dessert pies are delicious when judged on their own merits. Enjoy trying the early herb, minced meat, and pumpkin pie recipes from the time of Shakespeare. When they go to Table ſtrew on fine Sugar. 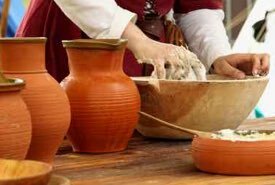 Take Spinage, hard Lettice, and a few ſweet herbs, pick them, waſh them, and ſhred them, and put them into your Pie with Butter, and Nutmeg, and Sugar, and a little Salt, ſo cloſe it and bake it, then draw it and open it, and put in Clouted Cream, Sack and Sugar, and ſtir it well together, and ſerve it in. An early recipe for making a pumpkin pie. Take a Pumpion, pare it, and cut it in thin ſlices, dip it in beaten Eggs and Herbs ſhred ſmall, and fry it till it be enough, then lay it into a Pie with Butter, Raiſins, Currans, Sugar and Sack, and in the bottom ſome ſharp Apples; when it is baked, butter it and ſerve it in. Waſh a good quantity of green Beets [tops], and pluck out the middle ſtring, then chop them ſmall, with two or three ripe Apples well reliſhed, ſeaſon it with Pepper, Salt, and Ginger, then add to it ſome Currans, and having your Pie ready, and Butter in the bottom, put in theſe herbs, and with them a little Sugar, then put Butter on the top, and cloſe it and bake it, then cut it up, and put in the juice of a Limon and Sugar.